I arrived this afternoon after an uneventful journey — although I may put up a separate post commenting on the soullessness of air travel. The RER train station is right in the Charles de Gaulle terminal, and the Châtelet-Les Halles station was less than a ten minute walk from my apartment, so I arrived more than an hour early. 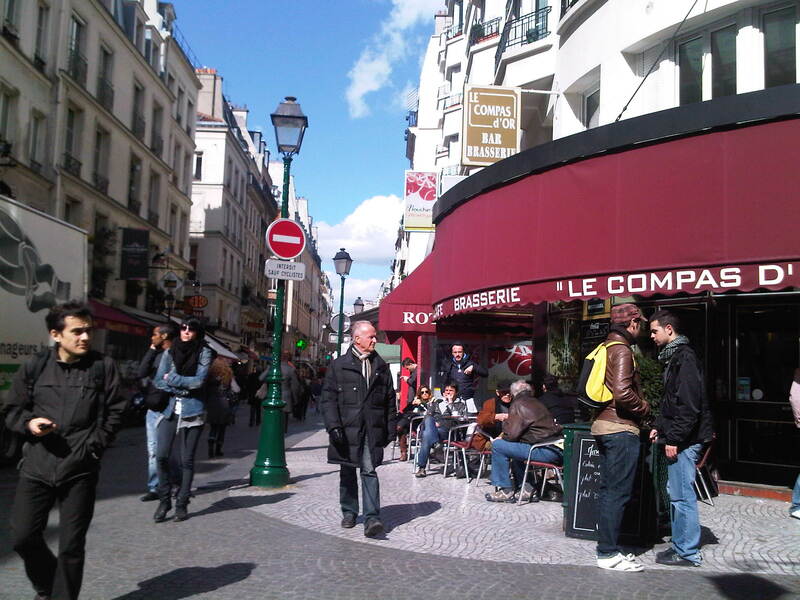 I had lunch at an agreeable cafe on the corner where my street intersects Rue Montorgueil, the main street of the neighborhood. I was blown away by the happy energy of the street; this is one of the nicest neighborhoods I have visited in all my travels. And I get to live here for a month! An American mother and son were eating next to me. I tried to maintain a discreet distance but I ended up giving them advice and taking their photo. Rue Montorgueil, just down the block from my April apartment. The owner of my rental apartment then arrived. He turned out to be a pleasant Brit, who had spent considerable time for work in Central Square, Cambridge. Needless to say, there was no language barrier. He was kind enough to schlepp my 25 kilo bag up all five flights of stairs! The place is small and a bit worn in places but perfectly fine, and the outside deck will be fabulous when the weather warms up a bit (it was sunny today but rather chilly). My proudest achievement of the afternoon was acquiring a passe Navigo découverte mensuelle — a monthly subway/bus pass. This requires a passport photo, which fortunately can be taken in booths in most Métro stations. There is also some tricky assembly, which the clerk was kind enough to do for me. I wasn’t so lucky with getting a SIM card for my BlackBerry. It’s easy enough just for voice but it looks as though it’s going to be difficult to get a card that also allows me to use the many data capabilities of the device at an affordable cost. After a bit of grocery shopping — successful except for the fact that a tiny bottle of Skippy (which has trans fat anyway) was 6 Euros! — I ended up having dinner at a lively restaurant on the ground floor of my building, Le Loup Blanc (which closed in 2014). Quite ready now to crash. Lots of agreeable first encounters to fuel good dreams.